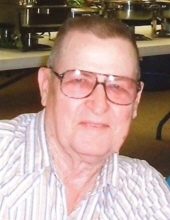 Robert L. McClaren, 83, of Cherryvale, Kansas passed away June 29, 2018 at the Cherryvale Nursing Rehabilitation Center. Robert Luther McClaren was born December 21, 1934 in Independence, Kansas the son of Alford and Bess (Mishler) McClaren. Robert was raised in Cherryvale and graduated from Cherryvale High School in 1953. Robert served in the Air National Guard and was honorable discharged in 1963. Robert was united in marriage to Suzanne Adey in 1956 and she survives at the home. Robert was a farmer in rural Cherryvale and worked at Dewey Auto Store. Many years later he owned and operated Bob’s Auto Parts in Cherryvale until his retirement. Robert enjoyed fishing, pheasant hunting and was an avid lover of animals, especially his dear pet Melissa. Robert was a jack-of-all-trades man and would lend a hand to anyone in need. Survivors include his wife Suzanne of the home, daughter Vicki (Greg) Swenson of Henderson, Nevada, Jude (Mike) Jones of Scottsbluff, Nebraska, 6 grandchildren, Kelly, Eric, Brooke, Jackson, Alexandra and Lucas, and 2 great grandchildren, Ella and Braden, brother Marvin McClaren of Prescott Arizona, brother-in-law David (Patty) Adey. Robert was preceded in death by his parents, sisters Wilma and Evelyn. The family will receive friends Friday July 13, 2018 from 6:00 to 8:00 pm, with celebration of life service at 7:00 PM at the Wickham Family Funeral home. Cremation has taken place and burial will be at a later date. Cherryvale Alumni has been chosen for his memorial. Contributions may be left or mailed to Wickham Family Funeral home 216 E. 4th Cherryvale, Kansas. To send flowers or a remembrance gift to the family of Robert L. McClaren, please visit our Tribute Store. "Email Address" would like to share the life celebration of Robert L. McClaren. Click on the "link" to go to share a favorite memory or leave a condolence message for the family.